I cannot believe what I just did.. I made a bonsai! walkthrough on ?how to create a bonsai? on your site. I woke-up this morning, with the idea of making a Bonsai. Never done it, don?t know anyone who has done it before. 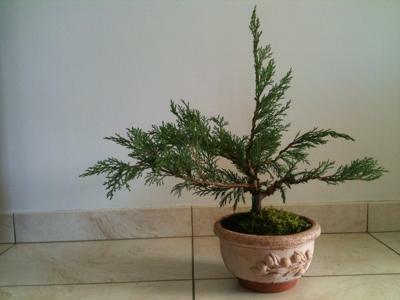 I googled ?how to make a bonsai? and the first link was your site. Reading your tutorial I just took a ?tree? that I recently planted and used it for my Bonsai. I was too excited and didn?t feel like getting the small stones for the soil however I will do that tomorrow. I did buy I nice pot, doh! Anyway, I add a picture of the result. I think it looks like a Bonsai and I?m so delighted with the result. The moss I just found in my garden. I hope it will survive. I guess the first days are critical to know if I didn?t took of too many roots or branches. This will not be my last Bonsai of that I?m sure. Well done. It looks good to me.